Replace the XXXXXXXXX with your ClickBank nickname and when you order you will receive a 50% affiliate payment. 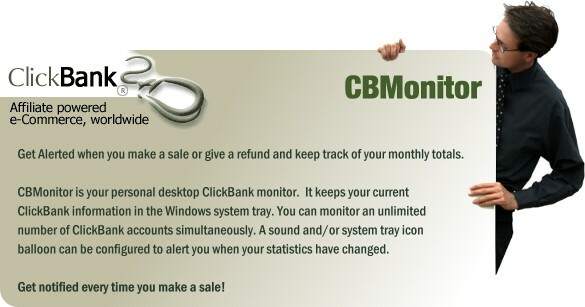 When you roll your mouse over the icon in the system tray, CBMonitor instantly shows you your current Clickbank Account status. Right Click your mouse and access all of the CBMonitor functions and setup options. You can view several Clickbank accounts, run reports, set options and open your web based Clickbank account without having to navigate to Clickbank and log on. Make Money Online with ClickBank and use CB Monitor to find out how much instantly!